We'll hear from Annette Klapstein and Emily Johnston, who closed valves on pipelines in Minnesota that carry tar sands oil into the US. A judge dismissed charges before their trial. On October 11, 2016, five climate activists, The Valve Turners, determined to act in the face of unfolding climate cataclysm, closed safety valves on the 5 pipelines carrying tar sands crude oil into the United States. This act of climate disobedience shut down 15% of US crude oil imports for nearly a day - the kind of actions they say are necessary to avoid complete cataclysm. 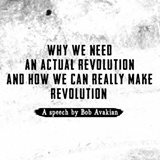 Next, the trailer from “Why We Need An Actual Revolution and How We Can Really Make Revolution,” the film of a recent speech by Bob Avakian, the Chairman of the Revolutionary Communist Party. It premieres online on October 19. Kate Morgan of No More Deaths, and one of the people who worked on a new report, Disappeared, How the US Border Enforcement Agencies are Fueling a Missing Persons Crisis. This report calls attention to a significant, albeit underreported outcome of contemporary US border policing strategy and practice - the disappearance of tens of thousands of migrants and refugees in the expansive wilderness north of the US-Mexico border.